Find out which cookbooks helped us save money and eat healthy over the years. I’ll share the good, the bad, and the yummy on each one. Today I tackled Well Fed, by Mel Joulwan. Which cookbooks help you save money and eat healthy? I’m the kind of person who reads cookbooks like novels – cover to cover. Then I put sticky tabs on all the recipes I want to try, and over the coming months (and years – let’s be honest), I try them. Since I tend towards minimalism, I have a fairly small cookbook collection. A few stragglers hang around for if-I-ever-get around-to-it (looking at you, Almonds Every Which Way), or nostalgia (like the adorable country church cookbook). But I regularly use nearly every volume. Over the next few weeks, I am sharing the cookbooks that stayed. I’ve cooked from many cookbooks – borrowed from libraries, snapped photos from a friend’s copy, given some away, even traded with my mom. The books I keep sport splattered pages, broken binding, and some of them naturally fall open to my favorite recipes. They helped me figure out real food, save money in the process, and fall in love with cooking. I hope they do the same for you. This cookbook came to me as a gift. Our budget was very small at the time, and the paleo diet was just starting to take Pinterest by storm. At that point, eating paleo was a vague wish for me. The part of me that also wants to try living in a tiny house, worldschooling, or going 100% vegan for 3 months (thank you, Vegucated) also wanted to try eating paleo. But realistically, I knew it wasn’t in the budget. Then someone gave me this book and I read it cover to cover. If you have never tried eating paleo, and for whatever reason you need to (going on Whole30, eliminating foods for digestive or health reasons), this is the cookbook to start with. I have since read many paleo cookbooks, and this is the only one I recommend to everyone. Eating healthy can be bland. Many of us learned to add cheese and bread to everything, and when you simply eat vegetables and protein, it’s easy to make it gross. Mel taught me how to harness flavor, understand spices, and make everything taste amazing with a few basic principles. When you have allergies or are trying a Whole30, this book has you covered. We had to go gluten-free and dairy-free for many years, and I never struggled with what to make for dinner because I had this cookbook. It also came in handy for our Cheapskate Whole30. I had heard of meal prepping before reading this book, but I never tried it until Mel outlined it with her unique approach. I didn’t like freezer cooking because I didn’t want to make entire casseroles ahead of time. Instead Mel had exactly what I was looking for. Well Fed is the reason I don’t have to cook a meal from scratch every night, but we eat homemade food every day of the week. Thanks to the Weekly Cookup section, I learned how to prep elements of meals ahead of time then assemble them just before dinner. We regularly eat dinner within 15-20 minutes (and it’s not pasta or sandwiches!). I like cookbooks with a story, authors that bring joy, fun, and a little sass to the kitchen. Mel delivers, and whenever I feel stuck health-wise or simply uninspired, I pick up Well Fed and read her story. Hot Plates – make a healthy dinner in 15 minutes. My very favorite thing about this book. Basil & Walnut Pesto – no dairy, and you don’t miss it! Meatza Pie – so much better than anything you’ll find in Pinterest. Meat & Spinach Muffins – weird right? No. More veggie than meat. Portable protein that’s not a protein bar or beef stick. Zucchini Noodles Aglio et Olio – the best. There is not much I don’t like about this cookbook. Mel delivers exactly what she promises: Paleo recipes for people who love to eat. It’s no surprise that cooking paleo is expensive. You have to balance your information with your real life budget and choose your priorities. When our budget was really small, I used Well Fed to make vegetables that delivered high flavor and took the spotlight in the meals. I perfected my baba ganoush. I made hot plates that used Mel’s flavors but added beans and rice or potatoes. I found myself feeling a little frustrated at my budget and inability to try some of the recipes. However, over time, I slowly cooked through them and discovered that what I was doing before worked just fine for our family. Well Fed is one of my favorite cookbooks because it taught me to cook flavor-packed, allergy-friendly food we actually loved eating. It taught me to make vegetables delicious. It gave me practical recipes as I figured out what eating healthy looked like for us. Check out Well Fed here or find it at your local library! Have you read Well Fed? What do you think about it? If you found this review helpful, let us know! Leave a comment, share it on Facebook or Pinterest, and follow us on Instagram or YouTube for more! 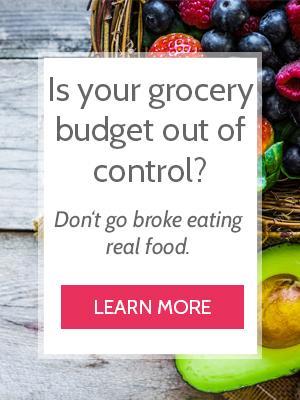 Slash your grocery budget and feed your family real food! Get simple, frugal, real food menu plans every month for FREE in the Cheapskate Cooks’ 1-Min Email. Get the next one here.